Pocket Farm often features more compact breeds when it comes to livestock and this is primarily because they often suit smallholders by being easier to handle or less demanding of space and food. However, occasionally that goes by the by and wonderful temperament and manageability are wrapped in a much larger package and that is exactly how we come to feature the Large Black pig. The Large Black is just that – a sizeable animal and Britain’s only entirely black pig. It is also one of the rarest. As with many of our traditional breeds, a focus on more commercially viable pigs (specifically the Landrace, Welsh and Large White) after the war saw a dramatic decline in numbers and when the Rare Breeds Survival Trust was founded in the early 70s the Large Black was placed on the critical list. The population has now recovered slightly from this low but is still categorised as vulnerable along with the British Lop and Middle White. 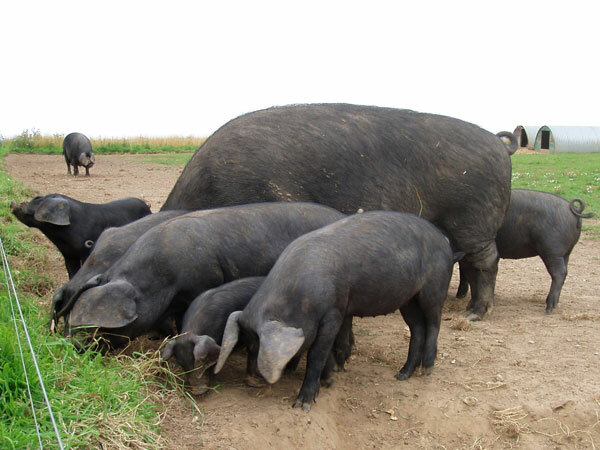 The Large Black is one of our oldest breeds and thought to be descended from the 16th century Old English Hog with the possible addition of genetics from imported Chinese stock. 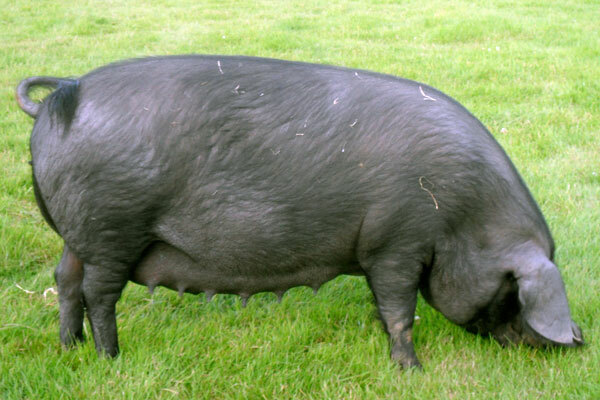 As a dual purpose animal the pure bred Large Black is prized for its slowly matured pork and bacon and, after the formation of the breed society in 1889, it flourished both in the show ring and as a popular choice to cross with whites. People often ask about the black skin so, for those who are wondering, the pigment is only skin deep so the rind of butchered meat is white. The breed is well known for being extremely docile and easy to handle despite its size and consequently can be contained using just one or two strands of electric. This easy going nature carries through into their maternal duties too where these wonderful mothers can raise litters of nine or more without the need for any specialist diets. The Large Black is also a very hardy breed. Able to resist sunburn due to its colour it is perfectly happy outside all year as long as you provide an environment that includes the holy trinity of pig requirements – a wallowing area to keep cool, a suitable shelter and additional rations when required. For more information about the breed or where to buy stock contact the Large Black Pig Breeders Club at via their website here. 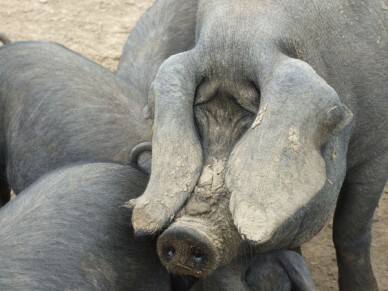 I want to know the suitable environment for these Large Black pigs. For these large pigs about half and acre of, preferably well drained, land with sturdy fencing would be suitable for two pigs. 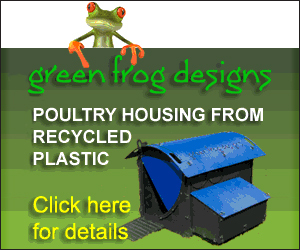 You can divide this in half with electric fencing or pig wire so one half can recover while the other is being used. Large blacks are less susceptible to sunburn than pink pigs but you should supply shelter such as a pig ark for sleeping and maybe another field shelter for them to escape from the elements. If land gets waterlogged easily an area of hard standing would also be useful. We keep two sows from which we raise litters through AI. They are housed in a half acre paddock and are moved seasonally as the land is turned over. They have a shelter each but unless one had birthed they tend to share one together. A single strand electric at 9″ keeps them in, Cornish Hedge ensures were they to leave a fenced area they would not have far to go. They respond to human company enjoying being scratched or brushed and your breeding animals learn their names and do not pester you for food between feed times. We have around 3/4 to one acre fenced off with stock fencing and divided in half, again with stock fencing. Will we also need electric for 2 large blacks to fatten up or will this be ok? There is probably someone with more experience of this than me but I would imagine a strand of electric would still be a good idea.